Since its post-war reconstitution under semi-state ownership, Alfa Romeo was forced to cut its cloth in ever more inventive ways. Budgets were tight and new model programmes hard-won. Expensive unitary body architectures needed to be well and truly amortised, which led to production runs that in retrospect probably lasted too long. A notable example being the 1962 105-series Giulia; a model line that eventually swelled to encompass a compact saloon, a 2+2 coupe/convertible, a 2-seater spider and a slightly larger compact saloon. Alfa got their money’s worth with this car, which for many Alfisti, remains the definitive latterday exponent of the Biscione. But by decade’s end, it was obvious that a newer, more sophisticated platform would be required, especially if Alfa Romeo was to capitalise on the growing affluence throughout Europe and further their export ambitions. The 1972 116-Series Alfetta was the result, a car which could be described as an amalgam of the essential technical principles of the successful 105-series and Torinese rival, Lancia’s Flamimia – down to its rear transaxle and de Dion suspension. The Alfetta wasn’t intended to replace the (more compact) Giuila, which continued with an unflattering facelift. Nor did it replace the 105-series derived 1750 Berlina; this a slightly longer, (both in wheelbase and overall length) Giulia variant, posing as Alfa’s then saloon flagship. Logic would have suggested the newer, more sophisticated Alfetta would have replaced the older car, but instead, it was given a mild facelift, an enlarged 2.0-litre version of Alfa’s twin cam four and a new name – Alfa 2000, remaining on sale until 1977. This wouldn’t be the last of Portello’s nonsensical product planning decisions. Initially available only with a 1.8 litre engine, a 1.6-litre version of the Alfetta became available in 1975. Two years later, a slightly larger Alfetta 2000 finally replaced the now very dated 105-series 2000 Berlina, becoming de-facto marque flagship. In 1981, the entire Alfetta range would be rationalised around this bodyshell, with engines now from 1.6 through to 2.0-litres. Several facelifts later, the Alfetta line was phased out in 1984 with close to 450,000 berlinas sold. Designed on a shortened 116 floorpan was the 1974 Alfetta GTV. Styled in conjunction with Giugiaro at Ital Design with input from Alfa centro stile, the 2+2 coupé followed the technical evolution of its saloon counterpart, replacing all but the smallest engined editions of the 105 Coupes. Once these were phased out in 1976, a full range of engines were offered, which included the 2.5-litre V6 in 1980. The GTV was phased out in 1987. The next significant 116-series saloon variant was the 1977 Nuova Giulietta. With an identical wheelbase, it was 60 mm shorter in length and 30 mm in height than its larger sibling. Available initially with 1.3 and 1.6-litre engines, it was schemed as a direct replacement for the venerable 105 Giulia. However, once more, Alfa’s product stratification eventually saw the Giulietta nipping at its larger brother’s heels. Production lasted until 1985. Perhaps the least regarded of the 116-series saloons is in fact believed to have been the earliest. This largest of the 116 bodyshells, (internally dubbed 119) was longer and wider, with an extra 110mm in the wheelbase, most of it being concentrated forward of the front bulkhead. Said to have been delayed by the oil crisis, when it eventually launched in 1979, Alfa’s claims regarding its origins saw few doubters – the Sei after all looked like a design from the beginning of the decade. Debuting the illustrious 2.5-litre V6 engine, it was initially fitted with six carburettors which gave it the dipsomaniac qualities (not to mention running costs) of a Celtic hellraiser. The Six is also notable for the fact that it’s the only 116-series variant to feature a front-mounted gearbox – not that this made much difference to shift quality, if contemporary reports are any guide. 1983 saw a facelift take place, which (partly) addressed its homely looks and offered more economical 2.0-litre petrol and 2.5 diesel versions. Sales fizzed out in 1986 with just over 12,000 said to have been made. It’s probably fair to call it a flop, if not a disaster of Gamma proportions. By the early 1980’s Alfa Romeo were in trouble. With government money in increasingly short supply, they were forced to embark on a joint venture with Nissan for a new volume model while work on a modular mid/large saloon (156-series) was stalling. Additionally, US multinationals were showing interest – particularly Ford. In this febrile environment, Alfa’s engineers were having to make a little go a very long way. 1984’s Alfa 90 then was by necessity a reskin of the Alfetta bodyshell, but would now encompass an engine range from 1.8-litres to the Busso V6, with a 2.4 turbodiesel for good measure. Styled by Bertone under Marcello Gandini, the 90 couldn’t really hide its decade and a bit architecture, cutting a similar dash to that of the contemporary Fiat Argenta, another contemporary reskin of a much older model. But if the exterior was conservative, the interior was a riot, featuring a confusing digital instrument panel and an amusing integral dash-mounted attache case – not to mention an non-ergonomic U-shaped handbrake. Innovation was alive and well at Arese, just not really of the useful variety. Despite being scorned by the UK press – (only the V6 was offered in the UK), over 50,000 were made until 1988. Even at this late stage Alfa maintained a two-pronged approach to the market. In 1985, the year of their 75th anniversary, the 75 berlina was launched. A reskinned Giulietta, the 75 was styled under Cressoni at centro stile to an even more polarising wedge profile to that of its immediate predecessor. Available with an engine lineup from 1.6 to 2.5-litres, the 75 was also notable for being exported to the US market as the Milano. Available only as a saloon, an attractive sportwagen version was readied but was cancelled by new owners, Fiat in 1986. The 75 was the final 116-series derivation, bowing out in 1992 with over 375,000 made. With over a million cars built over a twenty year lifespan, the 116-series gave Alfa Romeo a good return on its investment and saw them through perhaps the most difficult period of what has been a decidedly rollercoaster latterday existence. On the surface, these figures might vindicate Alfa’s strategy of model overlap, but one wonders if perhaps less proliferation and a clearer focus might not have yielded better results? The 116-series cars were never less than charming, despite some aesthetic challenges. In terms of their abilities however, to say nothing of their build integrity, they were often infuriatingly patchy propositions. Getting the most from your investment makes sound business sense, but over-diversification leading to model overlap is not. Alfa sold more of the less expensive (read profitable) Giulietta/75 models than the rest of the more expensive 116-Series combined, which perhaps tells us everything we need to know about Piedmontese product planning. Author’s note: The 1989 Alfa Romeo SZ was also based upon a short-chassis 75 floorpan, but due to its limited production run and specialised nature, it falls outside the remit of this article. Two numbers stand out: 12,000 and 50,000, the reverse of what would have thought. I was surprised how well the 75 sols so late in its life, I think there was nothing fundamentally wrong with the package even late in the 80’s early 90’s. It faired well in the boy racer crowd, and the competition wasn’t really any newer or better. Compared to the E30 3-series, Opel Manta, Sierra Cosworth, Saab Turbo crowd the 3.0 V6-spec 75 was a fairly competetive choice. The 116 series is starting to look like the antithesis of the supposedly new idea of the “scalable platform”. Everything but the Six and the GTV on a 2510mm wheelbase and more or less the same tracks. The GTV wheelbase was 110mm shorter – I wonder why they even bothered. Another 100mm or so between the front bulkhead and rear axle would have established a useful differentiation for the upper and lower order 116s, although the muddled product plan makes it difficult to distinguish which is which; the 75/Milano seemed to end up doing every job in the house. I hadn’t realised that the Six was intended to be the first of the series, although it makes many things seem more logical. Was the Busso V6 also put on hold owing to the oil crisis? There looks to be enough room under that bonnet to fit the straight six from the 2600. The front mounted gearbox fits in too. Big car people – even Alfa people – want automatics, and that’s hard work to combine with a rear-mounted transaxle. 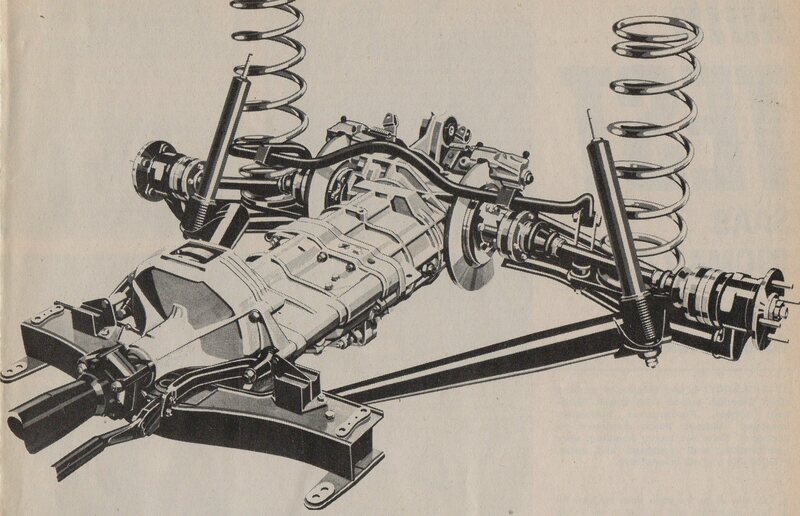 Eventually Alfa did manage to fit a ZF 3HP22 – the same ‘box as the Six – into the transaxle for the later Alfetta and the 75/Milano. There are still sound engineering reasons for not having the engine and transmission at opposite ends. Porsche did it well in the 1970s, but weight distribution zealots BMW have always found other ways to achieve the required balance. Robertas: the limitations of analogue design tools explains a lot of the overlap – I imagine moving bits even millimetres. creates lots of knock-on development problems. I sense that these cars had a core of common elements that stayed fixed; changes were made outside the core. Opel, with all their resources did the same thing with the Rekord/Senator “A”. Alfa pushed this expediency to an extreme. When I worked in a design office we had a lot of headaches with managing packaging and we had digital models to see the problem from all angles rather than just sections as they had in the 70s. To give credit, these cars did look quite different. I wasn’t aware so many vehicles were 116 variants. The 75 V6 was quite fun to drive, and the music from the 2.5l V6 was gorgeous. Even SWMBO used to take multiple trips through the tunnel with the windows down and foot planted. There were some real efforts at trying different things in the interiors back then, not all of which worked that well. But now, with one or two exceptions, interiors are rather “predictable”. I had a 155 with the Busso in 2.5-litre form. An atrocious car, sloppily built, using poor quality materials, with horrifying fit and finish, a nightmare to get parts for, constantly failing to proceed for the most ridiculous reasons… I miss it every single day. I can’t claim experience at the cutting edge of modern-day car design, but my understanding is that in the analogue world it’s relatively easy to stretch a floorpan or roof pressing lengthwise, but “aperture engineering” is a far more challenging business. An extreme example of the effect of this is BMC in the 1960s using the same set of doors for three cars which had virtually no other components in common. Fascinating, Robertas – a great bit of image sourcing. I had naively assumed the 75 doors were reskinned, but clearly not. Ham-fisted as it was in places, Cressoni oversaw a pretty decent job of modernising the Giulietta – most likely with a budget of a few thousand lire. Interestingly, the 75 was longer than the first series Alfetta – most of it in the tail. I think I’m the only person alive who doesn’t find the 90 to be an abomination. It was hardly Gandini’s finest hour and he was probably well past his best by then, but I find its sobriety rather appealing. Not sure what to say about that interior though. There’s very few cars I can say this about, but I cannot recall ever seeing one of these in the metal – ferrous or otherwise. Brilliant! Post of the day. I will cherish that knowledge. The same problem went for the 504/604. Thanks. This has been bugging me for a long long time now. I’d say the 90 is a reskin of the Alfetta outer door skin. I’d bet my wages the inner door skin and body in white is identical. And I’d say it’s a completely different door for the Alfa 6. And a third variant for the Giulietta. And I’d bet the 75 is identical to the Giulietta. That makes it three different doors to me, for a central section that looks almost identical to all variations of the car. And that is the biggest mystery of all, why all that hard work for something that doesn’t even look like it was changed at all in the first place? Eoin: you’re not alone in not disliking the 90. It has that “Trevi factor” to it. I also like the interior rather.